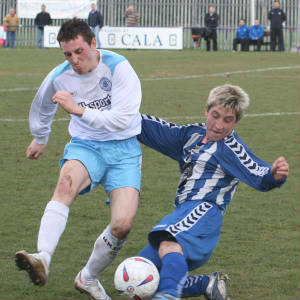 Penicuik were the first to threaten when Barr won a tackle inside his own half, ran down the left and crossed the ball to Cameron, but his header went just wide of the goal. In the 10th minute, Musselburgh were awarded a soft free kick and NELSON took full advantage when he curled the ball round the two man defensive wall to catch out keeper Livie. In the 24th minute, a clever flick of the ball by Barr over his marker allowed Milne a shot on goal that went narrowly past. 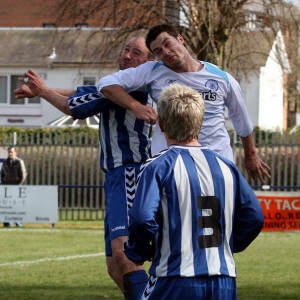 However, Penicuik were on level terms two minutes later when GAY rounded keeper McPherson to slot home from the tightest of angles. In the 29th minute, Musselburgh were denied a penalty claim by referee Taylor after a shot struck the hand of a Penicuik defender. Immediately afterwards, a long ball into the Penicuik box was flapped at by Livie, but cleared for a corner. From the corner Kelly’s header went inches past the post. In the 38th minute a cross by McCallum from the right was headed by King, but Livie pulled off a tremendous save to tip the ball over the bar. Then a powerful shot by Kelly crashed back off the crossbar and the rebound was driven past the post, but referee Taylor awarded a corner kick. From the corner, the ball bounced loose in the six yard box and Livie pulled off another great save to deny Musselburgh. In the opening minute of the second half, Currie should have scored, but hooked his shot wide of the goal. Then a neat turn and pass by Kelly set up King, but his strike was comfortably saved by Livie. In the 51st minute, Cameron got past his marker and his cross into the six-yard box was just missed by Montgomery. At the other end, Kelly dribbled his way past two Penicuik defenders only to see his shot tipped round the post by Livie. In the 59th minute, a dangerous Tansey cross was deflected away for a corner kick. From the corner, the ball was headed on to the crossbar, and Livie brilliantly saved the rebound. Immediately afterwards, a soft free kick was awarded to Musselburgh. Nelson curled the ball into the box, and Currie was inches away from heading home. In the 66th minute, Steele attacked up the left for Penicuik, but his probing cross was well cut out by McPherson at full stretch. In the 85th minute, another dangerous cross by Kelly was headed by Currie and for the third time the woodwork came to Penicuik’s rescue. Then a Mitchell header from a corner kick looped over the bar. One minute into injury time, substitute King should have sealed the points for Musselburgh, but his left foot shot flashed narrowly over the crossbar.